Opportunities How to leverage Wi-Fi and social media for marketing. CL E R MON T K . Y. THIS IS NOT YOUR PARTICIPATION TROPHY. EVERY BIT EARNED KNOB CREEK® KENTUCKY STRAIGHT BOURBON WHISKEY 50% ALC./VOL. ©2018 KNOB CREEK DISTILLERY CLERMONT, KY.
Donâ&#x20AC;&#x2122;t let negligent security ruin business. 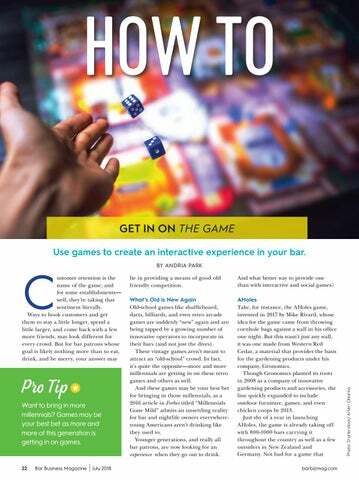 Use games to create an interactive experience in your bar. Give your customers screen time to increase social media exposure. A letter from our Editor Ashley Bray Industry news & announcements. In-depth analysis of beer, wine & spirits. Important dates for the month. Turn your one-time customer into a regular with Wi-Fi marketing. The key to finding good employees. what is your favorite game to play in a bar? 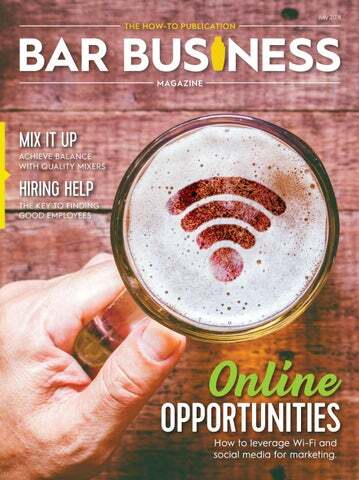 Bar Business Magazine (Print ISSN 1944-7531, Digital ISSN 2161-5071) (USPS#000-342) is published February, April, June, August, October, and December. January, March, May, July, September, and November will only be offered in a digital format at no charge by Simmons-Boardman Publ. Corp, 55 Broad St. 26th Floor, New York, NY 10004. Printed in the U.S.A. Periodicals postage paid at New York, NY and Additional mailing offices. 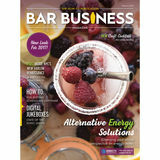 Pricing, Qualified U.S. Bar Owners may request a free subscription. Non-qualified subscriptions printed or digital version: 1 year US $45.00; Canada $90.00; foreign $189.00; foreign, air mail $289.00. 2 years US $75.00; Canada $120.00; foreign $300.00; foreign, air mail $500.00. BOTH Print & Digital Versions: 1 year US $68.00; Canada $135.00; foreign $284.00; foreign, air mail $384.00. 2 years US $113.00; Canada $180.00; foreign $450.00; foreign, air mail $650.00. Single Copies are $10.00 ea. Subscriptions must be paid for in U.S. funds only. COPYRIGHT © Simmons-Boardman Publishing Corporation 2018. All rights reserved. Contents may not be reproduced without permission. For reprint information contact: Art Sutley, Phone (212) 620-7247, or asutley@ sbpub.com. 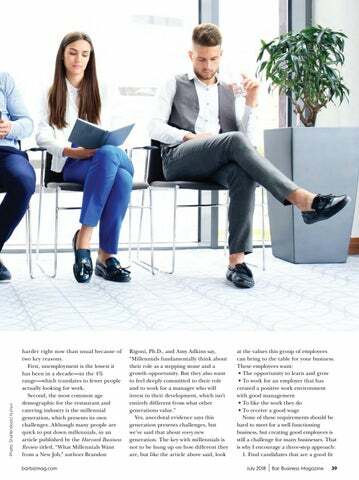 For Subscriptions, & address changes, Please call (800) 895-4389, (402) 346-4740, Fax (402) 346-3670, e-mail barbusiness@omeda.com or write to: Bar Business Magazine, SimmonsBoardman Publ. Corp, PO Box 3135, Northbrook, IL 60062-3135. POSTMASTER: Send address changes to Bar Business Magazine, PO Box 3135, Northbrook, IL 60062-3135. Instructional information in this magazine should only be performed by skilled craftspeople with the proper equipment. The publisher and authors of information provided herein advise all readers to exercise care when engaging in any of the how-to activities published in the magazine. Further, the publisher and authors assume no liability for damages or injuries resulting from projects contained herein. Scan the code to learn more about the art and science of beer systems. Perlick has a proven formula to maximize your beer system performance. If someone tells you building a beer system is as easy as 1-2-3, maybe they just don’t get Beer Science. Perlick engineers understand beer science and they specialize in creating beer dispensing system solutions. They’ll design your one of a kind system based on the unique environment in which it will operate so it performs flawlessly, in perfect balance, from day one. Guaranteed. Exclusively from Perlick Contact Perlick today to learn more. also said that clean restrooms help secure repeat business. So what constitutes a clean, quality restroom? According to survey respondents, toilets free of clogs and messes (84%), stocked essentials like soap and paper towels (79%), floors free of puddles and sticky residues (79%), an absence of unpleasant odors (71%), and soft, absorbent toilet paper (47%). Sofidel is just one company that offers a variety of products to keep your restrooms in tip-top shape. There are a number of other providers who supply cleaning products, solutions for unpleasant odors, bathroom supplies, etc. You manage and track your bar’s food and liquor inventory (and if you’re not, you should be! ), so what’s stopping you from doing the same with your cleaning supplies? If a current process isn’t working, you’re missing a necessary product, or you’re looking for an all-new solution to an ongoing problem, start shopping around. We suggest starting with our Buyer’s Guide in the bathroom supplies/accessories category: http://www.barbusinessdirectory.com Keep an eye out for more information on all things bathroom supplies and cleanliness in a future issue. Garnishes make sure your cocktails look great and are infused with a touch of added flavor and aroma. Lime/Lemon Wedge Start by cutting off both ends of the lemon or lime. Then sit the fruit the long way so the cut portion sits on the cutting board before slicing down the middle. ooking for a way to make your cocktails stand apart in this outdoor entertainment season? The Van Gogh Vodka team suggests perfecting a simple drink garnish to ensure your cocktails not only look great but are infused with a touch of added flavor and scent for the ultimate drink. IS HERE! CONTACT YOUR RUMCHATA DISTRIBUTOR TO ORDER THESE DOUBLE SIDED SHOT GLASSES TODAY! TRY A PIE HARD: ONE HALF RUMCHATA, ONE HALF APPLE WHISKEY. KEEP RUMCHATA ON THE BACK BAR AND IN THE COOLER. IF PEOPLE SEE RUMCHATA, THEY WILL BUY IT. RumChata®. Caribbean Rum with Real Dairy Cream, Natural & Artificial Flavors, 13.75% alc/vol. Agave Loco Brands, Pewaukee, WI. Please Enjoy Responsibly. RUMCHATA and CHATA are Registered Trademarks of Agave Loco, LLC. his year’s “Star of the Bar” Award, presented by the National Restaurant Association, went to Kristo Tomingas, a New York resident mixologist from Mayahuel Mariposa. He and nine other bartenders competed at four live, semifinal competitions with one winner from each semifinal advancing to the finals at the National Restaurant Association Show in Chicago this past May. The competition was open to all bartenders across the United States with the semifinal rounds held earlier this year in Las Vegas, Philadelphia, Orlando, and Chicago. The other Star of the Bar finalists included Niall McCourt of St. Petersburg, Florida’s Mandarin Hide; Derrick Li of San Francisco’s Vintage Courts; Adam Rains of Las Vegas’ Flock & Fowl; Morgan Zuch of Tampa, Florida’s Datz; and Luke Nevin-Gattle of Chicago’s Room 13. JEVO â&#x201E;˘ does all the work to make hundreds of gelatin shots in minutes. The great customer experience, the high profit margin, these are reasons why we love gelatin shots. But making them is a hassle. Jevo is fully automated and makes hundreds of shots in minutes, turning gelatin shots into a steady source of fast, hassle-free incremental revenue for your bar. Jevo also promotes at the point of decision and tracks usage. Then, it smartly ships you more flavor pod supplies right when you need them. Basically, Jevo is everything you could want from a profit center. ÂŠ 2017 ALL RIGHTS RESERVED. quite a bit of trial and error until it was just right. The restaurant I ran at the time was small enough for me to run while implementing a cocktail and wine program. With our cocktails, I was the only bartender, and I made most of our mixes from scratch, including our tonic syrup. When I parted ways to pursue my current business, I was constantly hounded by locals for a bottle of “that tonic.” I didn’t need long to decide that I should give my tonic syrup a shot on the market. TONYC (pronounced “tonic” but spelled like my name) hit the shelves here in North Carolina in late winter/early spring of 2016. My syrup is more bitter than sweet with flavors of baking spices and orange oil. It also contains cinchona bark, the source of quinine, but in low doses. If you’re considering making your own, take heed: too much cinchona can kill you. Literally. Use caution. Now that I’ve probably scared you out of making your own, feel free to pick up a bottle of my tonic and try it for yourself. I’ve included a cocktail recipe I love making with my TONYC that’s a departure from the typical gin and tonic—replacing the gin with mezcal. Tony Cross runs cocktail catering company, Reverie Cocktails, which distributes kegs of carbonated cocktails to bars, restaurants, and other venues. For more about his company or TONYC, email reveriecocktails@ outlook.com or visit reveriecocktails.com. AUGUST 19 National Potato Day We have a lot to thank potatoes for—fries, mashed potatoes, some vodkas. Pick your favorite and add it to today’s menu. AUGUST 6 National Root Beer Float Day Kick this favorite drink up a notch by adding liquor, liqueurs, or even root beerflavored beer or whiskey. August 26 National Dog Day Honor man and woman’s best friend. If your establishment is dog friendly, invite guests to bring in Fido and have some “yappy hour” specials for both man and beast. The saying goes if it’s not broke, don’t fix it, but we won’t stop you from experimenting with this classic through the addition of herbs, fruit juices, or even bitters. August 27 Just Because Day Today is the day to do something for no reason. If you have an unusual cocktail recipe you’ve wanted to try or a really unique craft brew to sell, now’s the time to do it. Malbec, Shiraz, Pinot Noir, Cabernet Sauvignon—they should all be at the top of your wine list specials. August 2 India Pale Ale Day Today celebrates one of craft beer’s most popular and enduring styles. Create a list of IPA specials and encourage your guests to try something new. August 20 National Lemonade Day There’s nothing better on a hot summer day than a cold, tall glass of (spiked) lemonade. There’s no end to boozy lemonade recipes, so take your pick and offer it as a special today. August 18 National Honey Bee Day Bees have faced an uphill battle over the last few years. Mix up a honey-centric cocktail and consider donating the proceeds to a bee conservancy or nonprofit. Donâ&#x20AC;&#x2122;t let negligent security ruin business. Photos: (Left) Shutterstock/ kondrukhov, (right) Shutterstock/ ImageFlow. Cameras deter crime and are great for piecing together how events unfolded. Pro Tip In the unfortunate event that something negative does happen at your bar, have a plan and train your staff on it. If your venue is known as a hotspot for crowds, think about implementing a method to track your customers, like wristbands. break, but there are plenty of other days where the opportunity for mischief can lead to serious damage and consequences. Prepare now in order to avoid legal action later. Justin R. Parafinczuk, Esq. is a Board Certified Civil Trial Attorney and shareholder with the law firm Koch Parafinczuk Wolf Susen, P.A. He can be contacted at parafinczuk@kpwlaw.com. Also Available: Hamptons Rosè Tasting Notes: Bright pink in color. The bouquet is characterized by red fruits. In the mouth a lively citrus and grapefruit give it an extra lift. Food Pairing: Pairs perfectly with duck confit, lobster roll, and oysters. Get in on the Game Use games to create an interactive experience in your bar. Pro Tip Want to bring in more millennials? Games may be your best bet as more and more of this generation is getting in on games. lie in providing a means of good old friendly competition. And what better way to provide one than with interactive and social games? What’s Old is New Again Old-school games like shuffleboard, darts, billiards, and even retro arcade games are suddenly “new” again and are being tapped by a growing number of innovative operators to incorporate in their bars (and not just the dives). These vintage games aren’t meant to attract an “old-school” crowd. In fact, it’s quite the opposite—more and more millennials are getting in on these retro games and others as well. And these games may be your best bet for bringing in those millennials, as a 2016 article in Forbes titled “Millennials Gone Mild” admits an unsettling reality for bar and nightlife owners everywhere: young Americans aren’t drinking like they used to. Younger generations, and really all bar patrons, are now looking for an experience when they go out to drink. Games can lead to higher customer retention rates. Be the It wasn’t enough for us to provide a Gluten Free, Kosher Certified vodka with no sugar added that satisfies the sophisticated palate. We believe that including premium ingredients, grown in the United States, including the best American Corn and adding pure Oregon water, makes the unique filtering method and 10 times distillation process worth the time and sacrifice for our ultra-premium customer. PassionFLOH INGREDIENTS 1½ oz FLŌH Pink Grapefruit Dragonfruit ½Fresh Pressed Lemon ¼ Wedge Fresh Pressed Grapefruit 3 dashes Cranberry Bitters TECHNIQUE Shake with ice and strain into chilled martini glass. Garnish with lemon twist. defeated opponent(s) drinks from their cup(s). From the game pieces right down to the spinner, Drink-A-Palooza’s detailed nuances and classic touches of college nostalgia are sure to keep patrons entertained for hours on end. “It’s more about the competition rather than really trying to drink as much as you can,” explains Wagner. “The more excitement that you have coming from your bar, the more people are standing around the table wanting to get on the table and play, and the longer people are going to stay, and the better time they’re going to have. They’re going to want to go back to that bar because they’re having a good time there.” In fact, the game has become so successful that bar owners can actually purchase the game as a physical table where people can play it right on the tabletop. Bar owners who are interested in purchasing either of these games for their business will receive a special discount off the retail price. 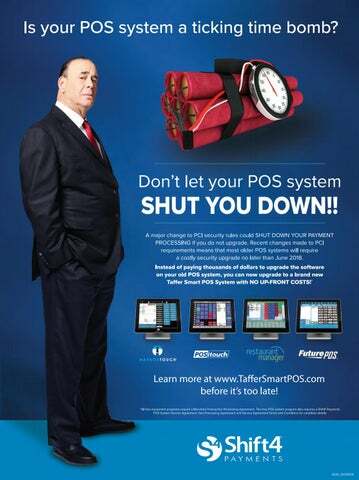 Meet a Smarter Point-of-Sale Solution. VeeaPOS is an integrated all-in-one POS platform that oﬀers a comprehensive range of capabilities including unique forms of payments to customer communications and engagements. Customizable to your needs. User Access permissions & staﬀ management. Support for moving and splitting checks. Customer self check-out with integrated tab support. Pre-authorization support for credit and debit cards. Cash drawer management & other hardware support. Menu management with daily special and happy hour support. Detailed customer & sales reporting. .. and then meet the rest of the family. Leverage the powerful Veea Platform to minimize costs and reach your customers like never before. Create unique customer experiences with supported applications for bars. The little box that can. Provide great in-store experiences to your customers and staﬀ with an easy-to-use Smart Hub. Go places. Veea is our app for your customers - it allows customers to interact with your business when you use our platform. Your business in your hands. Manage your business, connect with your customers, create promotions, deals and queues and more, all in one app. Payments made better. VeeaPay is your anywhere, anytime, smartphone-ready way to safely and securely accept card swipes, taps and dips. • Deliver live sports, music and digital games to TVs and tablets. • Provide guest Wi-Fi and secure employee messaging. • Push targeted advertisements to your customers. ... and so much more! • Get real-time feedback from your customers. • Push targeted promotions and deals. • Get discovered and see when customers are considering your bar. ... and so much more! • Create deals, promotions and coupons. • Alert your customers about upcoming events. • Manage queues and reservations with ease. ... and so much more! • Only 2.65% per swipe, dip and tap with no hidden fees. • All major credit and debit cards accepted. • Merchant portal to track sales, deposits, and more. ... and so much more! referenced the finding), 92% of consumers trust recommendations from friends and family above other types of advertising. This means word of mouth can be the most powerful means of driving new customers into your venue. But how do you cultivate it? By giving your existing customers a reason to promote and post about your business. THERE’S GLASSWARE. AND THEN THERE’S DRINIQUE. Drinique delivers products and solutions to address the challenges posed by traditional glassware and plastic. Our unique designs offer improved functionality, durability, stacking, and aesthetic appeal, as well as wide-ranging customization options. Experience the look and feel of glass without the added cost and liability. Drinique has become the number one choice in drinkware among the best bars and nightclubs in the world. Data Marketing Aside from control over screens, UPshow also gives bars and restaurants greater control over how they market to their customers. In the backend of UPshow, users have access to everything happening on social media in the venue as well as who is posting. Bars then have the option to do something about those social media users. “Whether it’s simply interacting with them and responding on Instagram or Twitter straight through the platform, or giving them the ability to offer a coupon or some type of incentive to return because bounceback is a really important metric for all venues—especially bars that want to build that repeat visitation,” says Gibbs. BuzzyBooth also offers a number of ways to interact with the social media users in your venue while collecting customer data. “The problem with people in the hospitality industry is it’s not easy getting customers’ data or contact information,” says Li. “Traditionally, people will do a loyalty program, but with loyalty programs, now you have to get your staff to ask the customer, and sometimes it’s quite annoying for the customer. “It’s proven that our system collects contacts much faster compared to existing loyalty programs out there.” With BuzzyBooth, customers can share their contact information with bars by choosing to opt in to the mailing list when they share or send their photo. Bars can then take that opportunity to market to customers with coupons and other offers to encourage repeat visits. Users can either send out blasts directly through BuzzyBooth’s system, or by exporting contact data to their existing marketing platform (i.e., Constant Contact). Both BuzzyBooth and UPshow are available through monthly subscription packages. BuzzyBooth is available for $250/month and a one-time shipping fee, and the company will replace the hardware for free if it is damaged. UPshow offers a variety of packages ranging from $75$100/month with a one-time hardware fee for the HDMI device. Most bars choose a core package that includes social media engagement, digital signage, and UpshowNow, and they add on trivia and gaming for an additional $25/month. Turn your one-time customer into a regular with Wi-Fi marketing. ave you ever signed up for one of those newsletters that you see on bar and restaurant websites so they can market to you? by Erik Shellenberger not somebody who entered their email address via your website and lives five states away, or somebody who lives in the next town over but is nowhere near your target demographic. Leveraging existing customers and cultivating them into regulars is a hell of a lot cheaper and light years more effective than mindless online data collection. Keep in mind—I do not get compensated by any of these companies to promote them. This is all based on personal opinion. There are several Wi-Fi marketing routers available out there including Zenreach and Yelp WiFi (Yelp recently purchased a platform called Turnstyle Analytics and renamed it Yelp WiFi). Use free Wi-Fi to gather customer data for marketing. are way less likely to get flagged as spam. Systems like this, however, get set up initially with default smart emails, which in my opinion are pretty worthless. For the smart emails to work, they have to be customized to your specific needs. A default email like, “Thank you for recently visiting _____ . For more info, check out our website here______,” is not going to bring people in the door. The right offer aimed at the right customer will. We often forget that marketing isn’t posting three to five times a week on social media, it isn’t making flyers for happy hour, and it isn’t taking selfies. It’s about one thing and one thing only—increasing revenue. Wi-Fi marketing with systems like Zenreach, to me, are a no-brainer, and I recommend this service to all of my clients. Oftentimes, we fail to take advantage of leveraging the most valuable customer of all—the customer sitting right in front of us. Wi-Fi marketing allows us to do so with zero staff training and zero instructions for anybody to learn. Remember, a return customer is five times cheaper than attracting a new customer, so work smarter and not harder. Erik Shellenberger has been in the restaurant and bar industry since he was 13 years old and worked for his mother in the food and beverage department at a ski resort. Since then, he has held every position from dishwasher to bartender to marketing director and everything in between. With a decade of corporate marketing experience, he has gone from student to teacher and now runs Bar Marketing Basics (barmarketingbasics.com). He has quickly grown his client base from his hometown of Scottsdale, AZ to across the nation with clients as far away as Caldwell, NJ. Photos: (top) Shutterstocl/ Dean Drobot; (bottom) Shutterstock/ Sergey Peterman. Getupto$500creditwithpurchaseof 2018 NFL SUNDAY TICKET One-time credit of $200 for FCO 1–200 (excluding Small Bar Offer) or $500 for FCO 201+. Credit will post to bill after 9/9 start and may take up to 2 billing cycles. *ALL DIRECTV OFFERS REQUIRE 24-MO. TV AGREEMENT. EARLY CANCELLATION FEE OF $20/MO. FOR EACH MONTH REMAINING ON AGMT. ADD’L FEES APPLY. PRICE IS AFTER A $10/MO. AUTO BILL PAY DISCOUNT FOR 24 MOS. New approved commercial customers only. Credit card req’d (except MA & PA). Pricing based on Estimated Viewing Occupancy (EVO) for select packages. Regional Sports Network (RSN) fee applies in certain markets. 1.855.714.7210 to order! ¹Based on a January 2018 national survey of Bar and Restaurant Subscribers who expressed an opinion. N=500 current Public Viewing subscribers (Bar or BLK) with a tenure of at least 3 months. COMMERCIAL XTRA PACK 24-MO. OFFER: Ends 10/28/18. To receive the promotional price of $89.99/mo., a 24-mo. agreement is required. After 24 mos., then-prevailing rate for base pkg applies unless canceled or changed by customer prior to end of the promotional period. Not stackable with any base package offers. ABP OFFER: New customers who subscribe to BUSINESS SELECT PACK or above with 24-mo. agmt. and enroll in Auto Bill Pay at time of sale will receive $10/ mo. bill credit for 24 mos. starting in the second mo. After 24 mos., the credit will end and services will automatically continue at the then-prevailing rate. $200 BILL CREDIT OFFER: To receive the promotional one-time credit of $200, customers must sign up for 2018 NFL SUNDAY TICKET with Fire Code Occupancy (FCO) 1-200 (excluding Small Bar Offer). Credit to be issued on or after 9/9/18. May take up to two billing cycles for credit to appear after 9/9/18. FCO validation certificate must be approved. NFL SUNDAY TICKET must be activated. $500 BILL CREDIT OFFER: To receive the promotional one-time credit of $500, customers must sign up for 2018 NFL SUNDAY TICKET with Fire Code Occupancy (FCO) 201 or above. Credit to be issued on or after 9/9/18. May take up to two billing cycles for credit to appear. FCO validation certificate must be approved. NFL SUNDAY TICKET must be activated. HARDWARE OFFER: Programming agreement, as defined by customer’s commercial programming rate card, required. Offer available to new commercial customers in commercial structures no more than three stories high. No single-family residences allowed. Up to four HD Receivers included per commercial location. Make and model of system at DIRECTV’s sole discretion. Offer void where prohibited or restricted. DIRECTV SVC TERMS: Subject to terms of DIRECTV Commercial Customer Agreement. Add’l Fees & Terms: Regional Sports Network Fee of up to $24.99/mo. applies in certain markets for COMMERCIAL XTRA PACK subscribers residing in a RSN ZIP code and one of the Collegiate-in-Market regions where BTN, Longhorn Network or SEC Network is included. Regional Sports Network fees are updated biannually based on the presence of Regional Sports Networks and/or Collegiate-in-Market programming in applicable ZIP codes. Receiver fees of $15/mo. apply for each receiver for COMMERCIAL XTRA PACK. $19.95 Handling and Delivery fee may apply. Taxes not included. Programming, pricing, terms and conditions subject to change at any time. INSTALLATION: Standard commercial installation included for BUSINESS SELECT PACK and above customers. Complex/custom installation extra. Applicable use tax adjustment may apply on retail value of installation. Visit directv.com/legal or call for details. To access HD programming, HD equipment required. Number of HD channels based on package selection. All DIRECTV Receivers must be continuously connected to the same land-based phone line or the Internet. NFL, the NFL Shield design and the NFL SUNDAY TICKET name and logo are registered trademarks of the NFL and its affiliates. NFL team names and uniform designs are registered trademarks of the teams indicated. ©2018 AT&T Intellectual Property. All Rights Reserved. AT&T, Globe logo, DIRECTV and all other DIRECTV marks contained herein are trademarks of AT&T Intellectual Property and/or AT&T affiliated companies. All other marks are the property of their respective owners. FIND EMPLOYEES it, you still win because they finish training 100% ready. Evaluations. These are not the ones with a 1–10 grade scale; instead they use the exact language from your job description. The employee either Exceeds, Meets, or Does Not Meet the standards you trained and tested them on. Trainers Guide. 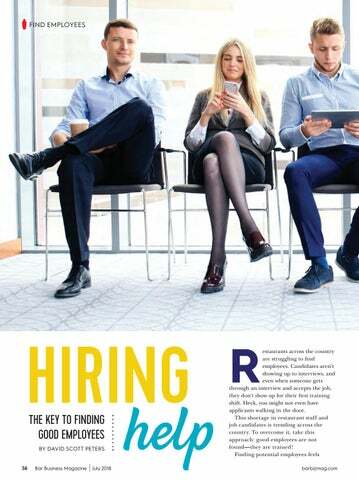 Having a new hire simply follow a longtime employee around for a shift or two does not work. They need to have a trainer who is following the same training plan that every employee follows. Consistency in training is critical for the success of your employees, and in turn, your business. In summary, good employees are not found—they are trained. The benefits of a great training system are huge! It increases sales by having happy guests. It lowers turnover rates, saving you thousands. It demonstrates to your employees you are committed to helping them learn and grow. A training system in place means managers manage consistently to a single standard, creating a positive work environment. And finally, when an employee knows their job, they are more likely to enjoy the work they do. All you have to do is add in a competitive wage and boom, you have a team of good employees. Low employment rate and generational differences are no longer obstacles. TheRestaurantExpert.com is helping independent restaurants find success in the highly competitive restaurant industry. Download a free report at therestaurantexpert.com/specialreport to discover the #1 secret to lowering food and labor costs and running the independent restaurant you’ve always dreamed of. Learn more about how David can help you at TheRestaurantExpert.com. Sign up for push notifications so you never miss a thing. Cult Status Blended Whisky Arrives in U.S.
Revel Spirits, the maker of artisanal, award-winning agave-based spirits, is launching both its flagship brand, REVEL, and a new category of distilled liquor, Avila®. Avila is made from 100% blue weber agave—the same plant base as tequila— but grown in the Morelos region, a small state in the south central part of Mexico. The Revel Spirits team created the new Avila® category to differentiate its REVEL agave spirit from tequila, which can only bear that name if produced in the Tequila region of Mexico. The ultra-premium agave spirit is handcrafted using both roasted and steamed piñas, a process that marries the old-world characteristics of mezcal with newer tequila-like techniques. REVEL Avila® provides a truly one-of-a-kind profile. REVEL is offered in three expressions: Blanco (white), which is immediately bottled after distillation; Reposado (rest), which is aged for 12 months in a once-used whisky oak barrel to provide a scotch-like taste; and Añejo (old age), a 96-proof spirit that is aged for 24 months in new French oak barrels, taking on the flavors of a cognac. First introduced in Japan in 1986, Nikka From The Barrel has developed a cult-like status in the world of Japanese whisky. Now, Nikka Japanese Whisky and U.S. importer Hotaling & Co. announce the arrival of Nikka From The Barrel in the U.S. The ultimate expression of Nikka’s skillful blending and housed in a distinctive square 750ml bottle, the 51.4% ABV whisky is available nationwide. An extremely complex blended whisky, Nikka From The Barrel was created to deliver full flavors and richness drawn from a blend of more than 100 different batches of malt whisky and grain whisky produced at Nikka’s Yoichi and Miyagikyo distilleries, and aged in multiple types of ex-Bourbon barrels and puncheons, ex-sherry butts, refilled, recharred, and remade hogsheads. The higher proof helps to merge the wide array of flavor compounds, while the 3-6 months of additional aging at Nikka’s aging cellar ensures a perfect marriage of flavors to harmonize the liquid. The iconic bottle is designed to reflect “a small block of whisky” – embodying the rich, strong taste of the whisky within. Anchor Brewing Company announces a new spin on Anchor Steam® Beer, San Francisco’s original since 1896. Arriving just in time for summer adventures, Anchor’s flagship beer is now available in cans for the first time, and this 19.2-ounce offering gives beer fans even more opportunities to enjoy Anchor Steam wherever they go. The distinctly flavored San Francisco original has been classically handcrafted in Anchor’s copper brewhouse for 122 years and counting. Neither fully a lager nor fully an ale, Anchor Steam is in a category of its own, created by fermenting a lager yeast at warmer ale temperatures in shallow open-air fermenters, and gentle carbonation in Anchor’s cellars through an all-natural process called kräusening. With flavors of mild toasted malt and a touch of caramel, Anchor Steam is balanced by bright, piney hoppiness. It has aromas of toasted bread crust maltiness followed by bright evergreen Northern Brewer hops and floral esters. A smooth and velvety mouthfeel is accompanied by lively bubbles and a crisp, bright hop finish. Prairie Organic Spirits debuts its revamped look, which represents its commitment to making organic spirits with unmatched quality. The bottles feature a new custom hammered design and wooden cork cap. The label features familiar and new colors, including earth tones and design elements representative of Prairie’s organic sourcing and farmcrafted commitment, as well as a common blue denim Prairie logo banner to unify the family line up. The vodkas feature longer bottlenecks for an easier pour, and the gin gets its own custom bottle. What led you to create Q Mixers? A night of drinking gin and tonics in my backyard in Brooklyn with some of my best friends where I was drinking really good gin on this beautiful summer night. Everything was perfect except for the tonic water. After a couple of drinks, I looked up and saw the gin bottle glowing in the moonlight, and I asked myself why isn’t the tonic water as good as the gin, or as good as my friends, or as good as this night? And the answer was that the world needed a better tonic water. So I made one. I started mixing stuff up in my kitchen, and I eventually came up with a prototype that some of the best bars and restaurants not only in New York but the country reached out to me and wanted to buy. ordan Silbert created Q Mixers back in 2007 based on an idea, but he was no stranger to good ideas prior to that launch. In fact, Silbert worked on post-9/11 rebuilding in New York City, which required plenty of brainstorming. “I was in charge of coming up with ideas, and then getting them funded and implemented, that would revitalize the area surrounding the former World Trade Center site in lower Manhattan below Chambers Street,” he says. “It was coming up with ideas and making things happen, but it was a completely different industry.” Today, Silbert works in the world of quality, carbonated mixers with his company Q Mixers, which come in seven varieties: Ginger Beer, Tonic Water, Indian Tonic Water, Ginger Ale, Club Soda, Kola, and Sparkling Grapefruit. Q Mixers are nationally distributed and can be found in many of America’s best restaurants, bars, and retailers. What makes your mixers different from others on the market? I treat these mixers like the best distiller treats their craft spirit, the best brewer treats their craft beer, the best wine maker treats their wine. So it ends up being a much better product. There’s a couple of specific reasons for that. We use much better ingredients—real quinine from Peru, real grapefruits from Florida, real lemons from Sicily, real organic agave from Mexico, real cinnamon from Africa. The second thing is we use a lot less sugars and we use fancy sugars—organic agave and organic cane sugars—instead of loads of high fructose corn syrup. The third thing is our product has more carbonation. A gin and tonic stays more carbonated if it starts more carbonated. So we have a custom glass bottle that’s a little thicker that enables us to put more carbonation in our bottles. Then we treat carbonation like an ingredient, and each of our flavors has a different amount of carbonation in it. It makes for a much more fizzy, refreshing cocktail. making really interesting spirits, so you need a mixer that enables you to taste those subtleties in each of those spirits. And if your mixer has less sugars, you can taste those subtleties a lot better. Sugar is a masking agent. If you put a bunch of sugar in something, you can’t taste anything else in the drink. You spent some time coming up with the bottle design. What is the importance of bottle aesthetic? We have a beautiful, silk-screened bottle. Instead of being a little plastic bottle that you have behind the bar or a soda gun, it’s actually delightful and beautiful. And it can be brought out to the guest and placed right in front of them. Any advice for bar owners/ bartenders in our industry? Get credit for making the investment in better mixers. Our mixers, now, are very price competitive relative to other glass bottle mixers, but they are more expensive than the soda gun. At the same time, they’re loads better. I’ve heard that the soda gun is the number-one reason for violations in New York City. Those lines are dirty, not cleaned well, and make lousy tasting product. So if a bar or restaurant is going to make the investment in a mixer, they should get credit for it. And that means really bringing it out to the guest. When someone orders a gin and tonic, vodka soda, or Moscow Mule, bring the bottled mixer out to the guest and pour it right in front of them. It delights the guest and gives them an experience they could not or would not have at their own house. And at the end of the day, that’s why people go out to bars and restaurants—to get an experience they wouldn’t have at home. It makes the guest feel special not only about their drink, but their entire experience at the establishment. What is the importance of using a quality mixer in a cocktail? SAV E MARCH T H E 25-27 2019 DAT E ! SEE YOU NEXT YEAR!